At your next 10k or marathon, take a moment to observe the feet of the passing herd and you’ll note one commonality: most runners – nearly 90% 1 – will contact the ground with their heel first. But like your mother said, just because everyone else is doing it doesn’t mean you should too! In fact, there’s a long-standing debate over the ideal foot-strike pattern for optimal energy efficiency and injury prevention. The recent minimalist running movement has further fueled the controversy, particularly in light of evidence that the forefoot strike encouraged by barefoot running may reduce both loading rates and injury risk 2,3. However, not all studies support the view that a forefoot strike is healthier or more natural. For example, distinct habitually barefoot cultures adopt different foot-strike patterns, and the choice of foot-strike appears to depend on complex factors including running experience and running speed 4,5. It might be intuitively appealing to model our running form after an elite marathoner or habitually barefoot Kenyan, but in order to determine whether their style is appropriate for the average Joe, we need to more thoroughly understand how a given foot-strike actually affects the body during running. Shod or bare? Fore or rear? 1. 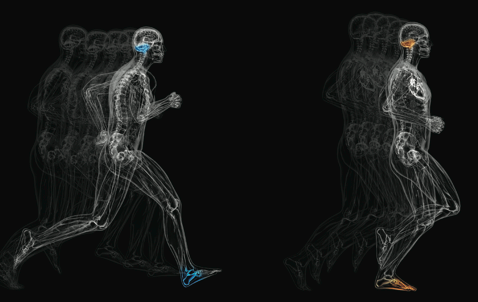 During rearfoot than forefoot striking, when runners wore shoes. 2. In shoes than barefoot, when rearfoot striking. 3. Barefoot than in shoes, when forefoot striking. So what’s the take-home message from these findings? Generally, and maybe most critically, there’s no one-to-one association between the soft tissue response and either footwear or foot-strike pattern; rather, the two factors influence each other in a not yet fully characterized manner. However, the authors provide a more specific conclusion for the complex interaction they observe – namely, that the muscle response is optimized when runners adopt their preferred foot-strike. Indeed, this enticing explanation is supported by the first finding, that damping was 93% lower when shod runners adopted their preferred rearfoot strike. But the support stops there. According to this logic, damping should also be reduced when barefoot runners adopt their preferred forefoot strike, yet no difference between the barefoot conditions was actually observed. So while this study suggests that it’s not just a simple matter of footwear or foot-strike, it also doesn’t exactly provide irrefutable evidence that whatever feels best really is best. However, it does set up an intriguing hypothesis warranting follow-up research. Given that none of the participants were experienced barefoot runners, understanding the barefoot conditions isn’t nearly as straightforward as interpreting the shod comparison. For example, it’s perfectly feasible that the preference for forefoot striking increases with barefoot running experience, and over time, this change might be accompanied by a corresponding muscle adaptation to the preferred forefoot condition. Furthermore, it’s difficult to extrapolate these findings to issues runners care most about, like injury rates or running efficiency, particularly since they only sampled from a single muscle group. Distinct foot-strike patterns and footwear differentially engage and impact the calves, knees, hips and ankles, and it’s quite unlikely that the calves are an appropriate proxy for all lower extremity soft-tissue. It would be interesting to track soft-tissue responses throughout various lower-extremity regions, to better determine how foot-strike or footwear influence dynamic shifts in damping capacities across a range of critical muscle groups. So can we finally declare death to the heated foot-strike debate? According to this study, the answer might not be forefoot or rearfoot, but just simply your-foot strike. Theoretically, this conclusion is logical. The body is highly evolved to discriminate between harm and benefit, and should therefore naturally encourage us to adopt safe, comfortable and healthy movement patterns. But that’s intuition, with a hint of evidence from one study. I suspect we’ll continue to see support for both individualized and more universal rules of running biomechanics as the story unfolds. So until we have more conclusive evidence, go ahead and scoff at either those “pretentious forefoot strike enthusiasts” or “naive rearfoot strikers” … since once again, you’ve probably had the answer all along. Larson P et al. 2011. Foot strike patterns of recreational and sub-elite runners in a long-distance road race. J Sports Sci. 29:1665-73. Daoud AI et al. 2012. Foot strike and injury rates in endurance runners: a retrospective study. Med Sci Sports Exerc. 44:1325-34. Giandolini M et al. 2013. Impact reduction during running: efficiency of simple acute interventions in recreational runners. Eur J Appl Physiol. 113:599-609. Hatala KG et al. 2013. Variation in foot strike patterns during running among habitually barefoot populations. PLoS One. 8: e52548. Lieberman DE et al. 2010. Foot strike patterns and collision forces in habitually barefoot versus shod runners. Nature. 463: 531–5. Enders H et al. 2013. The effects of preferred and non-preferred running strike patterns on tissue vibration properties. J Sci Med Sport. Tags: barefoot running, footstrike, muscle damping, research, running, running form, running shoes, sports science. Bookmark the permalink. Previous post ← When running on empty, caffeine to the rescue! Interesting research, thanks for sharing! Man! I wish I’d seen this 15 years ago. I’ve had CECS for 15 years (I call it shin lockage) and it’s really a mystery to me why I can run marathons, half marathons, 10k’s and 5k’s without getting it then I’ll get it for no apparent reason. I’ve been able to come to some conclusions, though: I don’t get shin lockage if I sprint or do hill repeats (running more on toes?) Is chronic exertional compartment syndrome (CECS) a more specific term for the generic condition generally referred to as “shin splints”? I love this! We have so much to learn before the “correct” running style can be declared. I often tell people I’m not going to get in the debate of which style is better, everyone should just do what feels right. However, as you point out that advice might be flawed. I hear thousands of testimonials of how a change to a forefoot strike has eliminated chronic injuries and increased performance. Only half of the studies I’ve read would back this up. I guess without definitive studies on this we should just stick to the mantra of if it ain’t broke don’t fix it. I’ve run injury free with a forefoot strike my entire life so I know what works for me.